L & A Contracting Company has been in business since 1947 and possesses a wide range of expertise in construction. By performing work throughout the Southeastern United States, they have earned a reputation for success built on high quality, skilled craftsmanship and unlimited capabilities. Recently, L & A Contracting Company has engaged in the debris clean-up field of work for various government agencies. This work involves the actual removal of downed vegetation due to storm damage and the disposal of the debris. In the area of wastewater treatment, L & A Contracting Company has constructed lagoon levees, installed and maintained aerators, performed dredging and cleaned and closed out existing holding ponds. Engineering, procurement and field construction of major highways, bridges, airport paving, and drainage structures. L & A Contracting Company maintains and operates the boats and barges necessary to offer complete construction services in coastal and marsh areas. Full range of technical, analytical and field services and equipment for the testing, characteriztion treatment and disposal of hazardous and non-hazardous waste. Throughout our 60 plus years of experience we have expanded to cover a wide spectrum of municipal services. 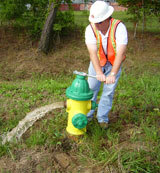 We offer fire hydrant repair, preventative maintenance, and debris removal.